Wild Idaho Rising Tide (WIRT) offers our exuberant gratitude to benefactor Tom Hansen, composer/performer Roy Zimmerman, and musical guide Jeanne McHale, for the uplifting song created for WIRT in May-June 2013, The Tide Is Rising! Please share freely and revise as your own anthem, Rising Tide activists and friends. 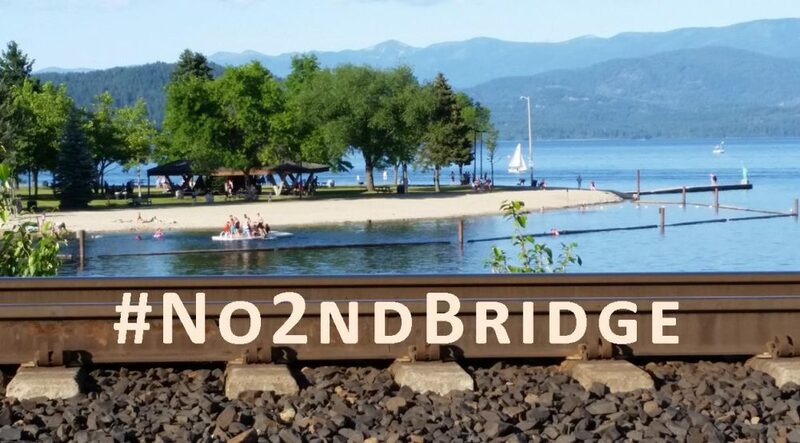 As Portland Rising Tide and 350 posed and hung a bridge banner declaring “Coal, Oil, Gas: None Shall Pass,” WIRT activists arrived at the Port of Wilma to confront two tar sands megaloads that passed under the same bridge the week before the Summer Heat: Columbia River Climate Action. Unlike in Portland, a few protesters and a Lewiston Tribune reporter showed up at 3:30 pm on Saturday, July 27. Everyone else likely assumed that the Forest Service and conservationists would keep these evaporators out of the Highway 12 wild and scenic river corridor, although most of the region had failed to stop similar transports to Alberta tar sands operations. But the three of hundreds of potential protest participants observed that one of the Omega Morgan shipments was missing! Did it sneak up Highway 12 unannounced? We questioned the on-site security guard who refused to answer our queries, searched both the Ports of Wilma and Lewiston, contacted our non-activist allies who rarely work during weekends, and alerted and asked multiple associates around the region. No one in the Kamiah Nez Perce community had seen the missing megaload. Like during the 2011-12 ExxonMobil/Imperial Oil invasion of Highway 95, we felt betrayed and abandoned by industry, government, and absent allies and protest participants. We cringed at the same-day juxtaposition of people downriver giddily stating “None Shall Pass,” as they posed against, rather than directly confronted, fossil fuel perpetrators, perhaps assuaging guilt with ‘photo ops’, while a megaload disappeared before anyone but a few diehards bothered to face it on the frontlines. As we have worked to instigate for years, we hope that Americans will wake up and fight back in time, meeting megaloads with resistance at the coast and all along the 465-mile trip up the Columbia/Snake rivers to Lewiston area ports. Our activist allies are still wondering why we have not blockaded Highway 12 yet. On Monday, July 29, Mia Carlson-Simpson of Big Country News solved the missing megaload mystery with a few phone calls. The module was in a nearby shop at the Port of Wilma, where presumably a crew is installing its insulation (or reducing its height for interstate overpasses?). This Thursday, an ally noted that “Omega Morgan may have gone down Highway 95.” With plenty of unverified or unshared information emerging, we remain vigilant of any megaload movement up Highways 12 or 95, not entirely convinced that the Forest Service will hold the line, that conservationist allies would call for an injunction, or that the police will not continue to reinforce social and environmental injustice. “An oversized load that was delivered to the Port of Wilma just west of Clarkston a week ago has not been transported out of the region, although some people have asked ‘Did it sneak up Highway 12 last week?’ Activists with Wild Idaho Rising Tide showed up on Saturday, to protest the two loads that were unloaded from their barges on July 22, and discovered that there was only one sitting there. According to Olga Haley, a spokeswoman for transport company Omega Morgan, the load is being ‘stored inside a building at the Port of Wilma.’ Meanwhile, she adds that there is no other news since the company is working with the U.S. Forest Service and the Idaho Department of Transportation on the permit situation. This article partially revealed industry’s game plan at the Port of Wilma and on Highway 12. Ellett Industries of Port Coquitlam, near Vancouver, B.C., manufactured the evaporators stranded at the Port of Wilma. Because the modules are too large to travel B.C. roads, they were moved in a wasteful, industrial, business-overkill-as-usual way: shipped down the Washington coast to Vancouver and barged up the Columbia and Snake rivers, for truck transport through Idaho and Montana to Alberta tar sands operations. Ten people will install insulation in one of the evaporators for two to three weeks at the port. The Athabasca Oil Company evaporators would recycle steam used to soften and extract underground Alberta tar sands deposits and reclaim water for other purposes. The Idaho Transportation Department (ITD) has not yet issued permits to hauler Omega Morgan, but sent the Forest Service a four-page letter explaining its permitting process and megaload movement logistics: “We believe these actions should address your concerns.” Washington and Montana have approved applications and will issue permits if ten Omega Morgan megaloads traverse Highway 12 until January. On Monday, July 29, the Idaho Transportation Board held a special meeting at ITD headquarters in Boise. The executive session agenda included personnel and legal (megaload?) issues, along with old and new business. Media allies have contacted ITD to learn the results of this meeting. See the posted July 26 letter from Nez Perce-Clearwater National Forest Supervisor Brazell to ITD. “The U.S. Forest Service is revising one of its interim criteria designed to define and govern the transport of megaloads…greater than 16 feet wide or 150 feet long…along U.S. Highway 12 as it passes through the Nez Perce-Clearwater National Forest and its Wild and Scenic River corridors…[It] is also asking to review megaload applications before permits are awarded by the state and is taking issue with the state’s insistence that it lacks authority to deny the permits…Loads meeting any of the criteria wouldn’t be approved by the agency until it developed a formal megaload review process and consulted with the Nez Perce Tribe,…preceded by a study that outlines the cultural and recreational values of the area.” Forest Service/Nez Perce Tribe consultations begin on August 20. Thanks to James Blakely and Jo Kirkpatrick, both of Boise, for tracking this issue and expanding WIRT knowledge and activism! Here is how the evaporators at the Port of Wilma, which cannot fit through tunnels, snow sheds, and interstate overpasses in B.C., Washington, etc., will be used in Alberta, with likely disastrous results. Would WIRT detractors be proud to tell their children that their evaporator transport jobs or support facilitated such catastrophes? For at least six weeks at four separate sites in the Beaver Lake Cree First Nation traditional territory, “Canadian Natural Resources Ltd. has been unable to stop an underground oil blowout that has killed numerous animals and contaminated a lake, forest, and muskeg” at the Cold Lake Air Weapons Range in Alberta, off-limits to the media and public, due to active Canadian military testing. Its in-situ extraction methods inject thousands of gallons of superhot, high-pressure steam underground to liquefy and crack hard bitumen deposits and pump them to the surface, using more carbon and water than open-pit tar sands mining. Inadvertently creating fractures from the reservoir to the surface, spills from pressurized oil beds cannot be capped or turned off like customary wells or pipelines and could seep for months. By 2020, in-situ extraction could comprise 40 percent of tar sands production. The Cree are “pursuing a constitutional challenge that argues the cumulative impacts of oil sands industrial development are infringing their treaty rights to hunt, fish, and trap.” Band members have been unable to access graves alongside the lake in the area affected by the spills. Thanks to WIRT facebook friend Danny Showalter for this useful information: “That’s a Portland-area, Hillsboro-based trucking company that’s agreed to haul those megaloads,…Omega Morgan? Here’s the Portland equity firm that owns them, the capital behind these policies, for info’s sake.